We manufacture numerous covers for Swim-spas, Exercise Pools, Oversized and free-form shaped spas. The common denominator is that they need more attention to detail than when ordering run-of-the-mill spa covers. You can now order a swim-spa cover online for 99% of situations. We have already included DOUBLE ENCAPSULATED CORE within the pricing and depending on the size of the swim-spa covers they will include a combination of thicknesses to provide the taper for water run-off. All EPS used in swim-spas is of 'Premium' Level 1, 2 or 3 grade. The ordering system is 'intelligent' in that if a thickness upgrade is possible for your particular cover it will show this as an option. We also offer an upgrade to'Walk-on' option which gives your cover tremendous additional strength. Typically a majority of swim-spas are between 400 & 460 c.m. in length with a width of up to 240 cm; the width being dictated by their abilty to fit into a standard sized container for transportation around the world. Their length may be longer, in the order of 580 to 620 c.m.- exceptionally as much as 900 cm. These products which need more than a 2 section hinged cover (like a standard hot tub cover) present different challenges such as ensuring sufficient rigidity in the central cover/s which are only supported on 2 short sides as opposed to 3 sides (2 x short + 1 x long). MOST SWIM SPA COVERS ARE JUST MANUFACTURED AS 2 or 3 SPA COVERS - THIS IS ALWAYS GOING TO CAUSE PROBLEMS with SAGGING and STANDING WATER. 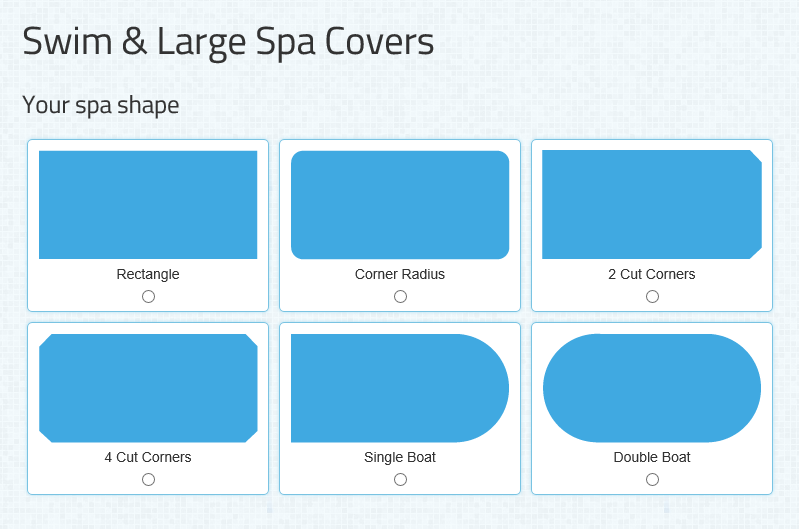 Let us make you a PROPER cover for your swim-spa or multi section larger spa. During the order process you will get a visual image of your new cover as shown in the example below. You also have the opportunity to enter any comments during the order process. We then work with you after the order is placed to make any specific changes that you may want with regard to things like positions of handles & straps. Cover handling devices should always be fitted where possible to minimise potential damage to covers and make the task of removing/replacing covers much easier. We can provide cover-handling solutions even if your swim spa is in-ground/in-decking. Entrust your replacement cover order to Coversfortubs and take advantage of our unrivalled understanding of how cover-systems should perform, how to design the right system for your needs and how to make one that will be durable and longer lasting. Call us NOW if you need an initial discussion on 0333 6666 555 or order with confidence on-line and be assured that we will always liase with you to ensure that the final design is to your requirements. There have always been some spas which fall outside a 'normal size', historically these have largely consisted of in-ground commercial or semi-commercial spas e.g. 10ft diameter over-flow spas. But in recent years we have seen the advent of theatre spas & party spas which cater for perhaps 9-11 people. These spas can be anything up to 3,800 mm in length and simply cannot be accommodated with a normal size cover - they are more akin to a swim-spa in size and need to be treated as such. Free-form spas are shapes that are NOT drawable from dimensions i.e. it is a shape which doesn't have fixed points with known angles or radii from which a drawing can be made. Examples of such shapes are shown below. There are only two ways to (safely) replicate a cover for this type of spa. The first (if an existing cover is available) is to unzip and remove the outer cover; we will collect via PARCEL FORCE and make you a new cover by following the pattern (template) that this provides. The second method is to produce a template of either the existing cover or make a new template from the actual spa. The later method requires a degree of patience and ideally the help of another person. We can supply a templating KIT which is designed specifically for this purpose. Please email us for details info@coversfortubs.co.uk or call us on 0333 6666 555.